November 10, 2005 – Fifty-two years ago on May 20, 1953, it’s been said by a variety of sources that some kind of unidentified aerial craft allegedly crashed in a desert site near Kingman, Arizona. Follow the red arrow in the map below from Kingman to the yellow marked location two hundred miles straight north. The yellow marks a dry lakebed east of Fishlake National Forest which the U. S. government photographed in a grid pattern on June 11, 1953. 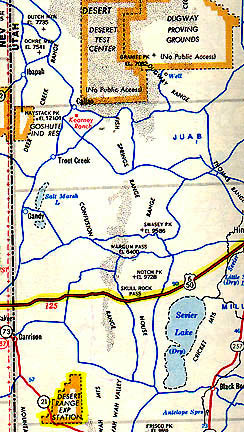 Red arrow points 200 miles straight north from Kingman, Arizona, to the yellow-colored DRES facility near alleged lakebed crash site, perhaps in May 1953. Two dozen high altitude photographs were taken in a grid pattern of a large triangular feature in the dry lakebed near a government facility known as the Desert Research Experimental Station, or D.R.E.S. The triangle measured approximately 4,400 feet long and 2,700 feet wide. The measurements are from a 1999 geologist’s analytical report. 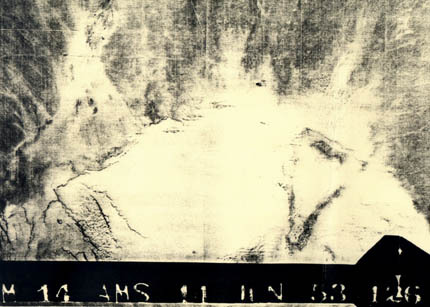 “M 14 AMS 11 June 53 126.” Aerial photograph taken on June 11, 1953, one of two dozen all focused on the region of the triangle feature which measures 4,400 feet long by 2,700 feet wide. The location of this unusual triangle feature is 175 miles south of the highly classified Dugway Proving Grounds. At least one former United States Air Force pilot says he has firsthand knowledge that a large aerial vehicle “not from this world” impacted in 1953 where the triangle was dug to bury the craft – and perhaps to provide a permanent marker in the lakebed for unknown purposes. Dugway Proving Grounds and its highly classified test center are 175 miles north of the DRES facility and the odd triangular crash site. Dugway is south of Salt Lake City, Utah. 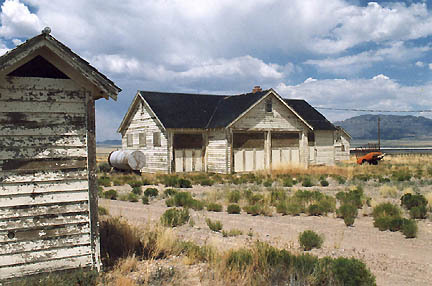 The nearest small town to the lake bed is Garrison, Utah. A few miles beyond is Baker, Nevada, where at least one local resident remembers a vivid explosion of something in the direction of the lakebed around 1953. 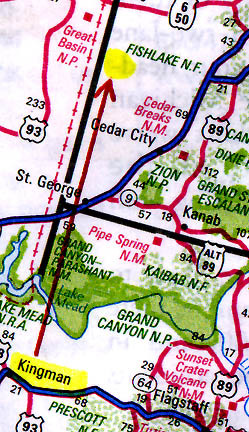 Garrison, Utah is 30 miles northwest of the DRES facility. Baker, Nevada, is ten miles beyond Garrison. On July 16, 2005, I’m standing inside the odd triangle feature in the lakebed. 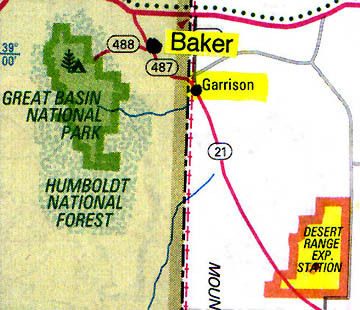 Three miles away beneath the yellow arrow is the U. S. Forest Service’s Desert Research Experimental Station, DRES. 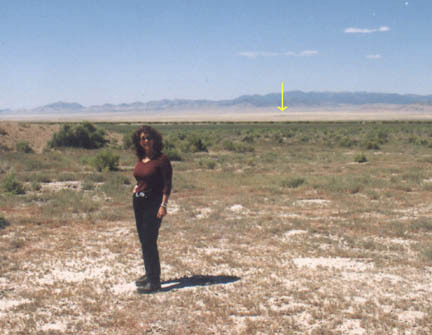 Linda standing inside lakebed triangle on July 16, 2005. 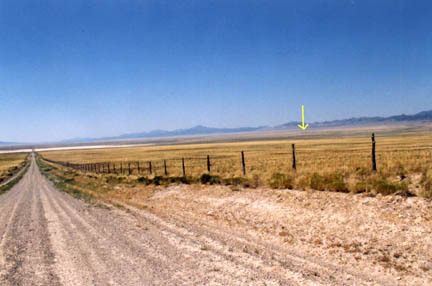 Arrow points to DRES facility three miles away, highlighted by yellow arrow. Photograph by Steve Jones. 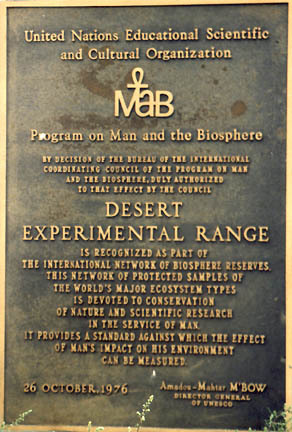 The Desert Experimental Research Range was established in 1933 by President Herbert Hoover “as an agricultural range experiment station,” covering 87 square miles. Map of the DRES’s 87 square miles featured in plaque at DRES facility which was established in 1933 by President Herbert Hoover. Photograph by Linda Moulton Howe. 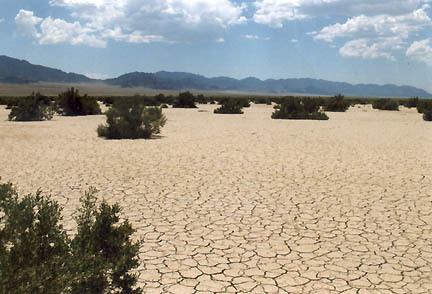 According to U. S. government history about the site, range lands during the severe drought years of the 1930s had deteriorated, affecting survival of livestock and ranchers. 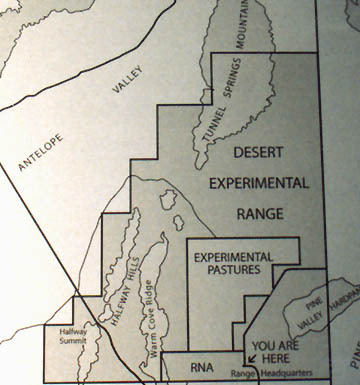 No one knew how to manage desert plants, so the Desert Experimental Range was created to learn. Dry, cracked lakebed inside triangle near DRES on July 17, 2005. Photograph © 2005 by Linda Moulton Howe. In 1933, the Civilian Conservation Corps, or CCC, built the DRES facility where the yellow arrow points below. 135 miles of fence was also built by the CCC to mark the boundary of DRES using hundreds of wire rolls and over 40,000 wood posts cut by hand. Most of the original posts still stand ­ a testament to the dry, high desert climate there. Road and 1933-built fence to lakebed triangle. 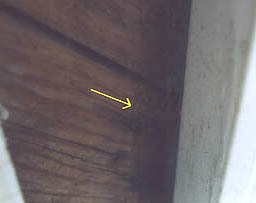 Arrow points to DRES. Photograph © 2005 by Linda Moulton Howe. 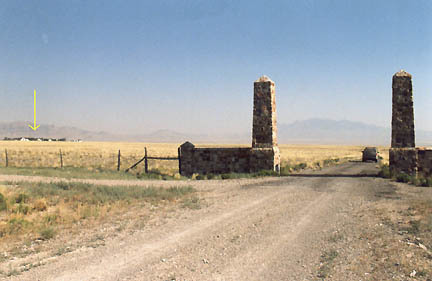 By 1935, the CCC built these two stone obelisks as a gate entrance to DRES, indicated by the yellow arrow. Stone obelisk gate to DRES, July 17, 2005. Photograph © 2005 by Linda Moulton Howe. Ordered by Amadon-Mahtai M’Bow, Director General of UNESCO on October 26, 1976, under the decision of the Bureau of the International Coordinating Council of the “Program On Man and the Biosphere.” Exactly why this occurred and what the legal implications are in making DRES a U. N. biosphere are still not clear. United Nations Biosphere Reserve Designation for DRES by UNESCO on October 26, 1976. Plaque built into stone at driveway entrance to DRES buildings. Photograph © 2005 by Linda Moulton Howe. 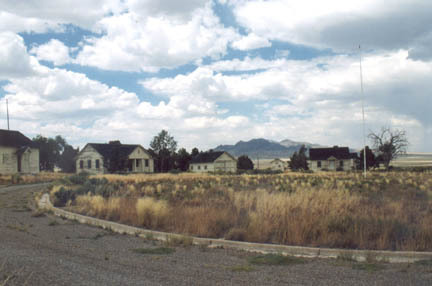 Weed-filled circular driveway ringed by deteriorating DRES buildings and empty flagpole. 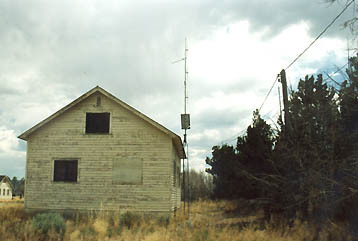 July 17, 2005 photograph © by Linda Moulton Howe. Peeling paint and boarded up DRES buildings. July 17, 2005 photograph © by Linda Moulton Howe. 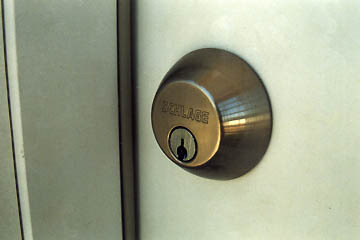 New lock hardware on peeling paint at DRES, July 17, 2005. Photograph © by Linda Moulton Howe. 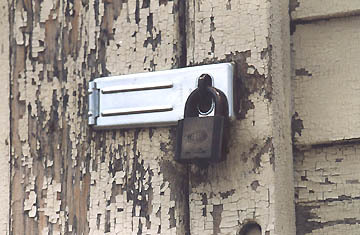 New lock on brand new door surrounded by peeling paint, July 17, 2005. Photograph © 2005 by Linda Moulton Howe. The new doors and locks stand out as peculiar amid all the peeling paint and unkempt look of the buildings and grounds. There is also fresh weather caulking around the doors. Above: New door and locks surrounded by peeling paint. 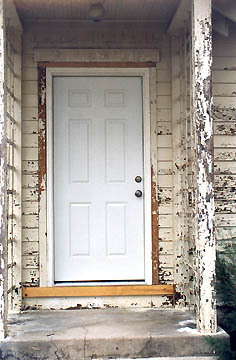 Below: Fresh weather caulking on peeling paint around new door, July 17, 2005. Photograph © 2005 by Linda Moulton Howe. From behind one of the decrepit-looking DRES buildings, a new mono-directional antenna is powered by a new solar energy array constructed several hundred yards from the DRES facility. 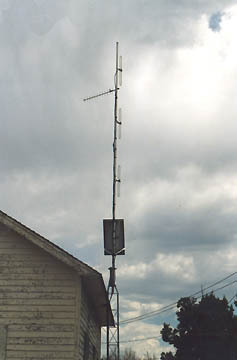 Above and below: Mono-directional antenna powered by new solar energy array, July 17, 2005. Photographs © 2005 by Linda Moulton Howe. Continued in Part 2 – An Intelligence Safe House Hiding in Plain Sight?